The Flo-tech Contour Lo-back cushion gives postural support whilst reducing pelvic and lower back area pressure. 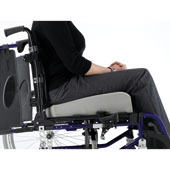 Specifically designed to have a lower rear edge allowing the user to sit slightly reclined, this cushion is suitable for those at a high risk of developing pressure sores. The Flo-tech Contour Lo-back cushion reduces the need for a wedged cushion or a reclined backrest and minimises the tendency for the user to slide forward. This moulded foam cushion provides a three-dimensional form, which is highly durable, increasing the product’s longevity. The fully water resistant cushion cover features an anti-slip base with carry handle.